Everybody knows how effective elderberry syrup is at beating the flu, but there are many other ways to use elderberries and elder flowers to get healthy. Some even work better than elderberry syrup! 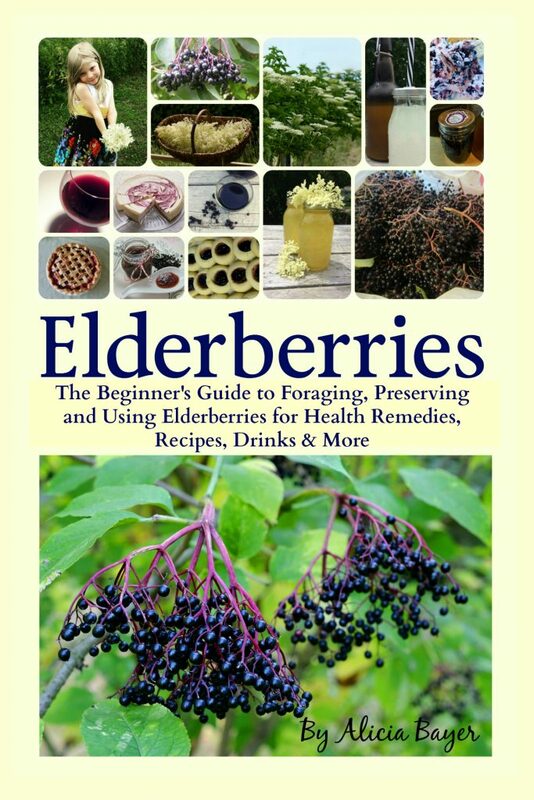 Here are three great medicinal remedies you can make with elderberries and elder flowers, from my book, Elderberries: The Beginner’s Guide to Foraging, Preserving and Using Elderberries for Health Remedies, Recipes, Drinks and More. The book contains information how to find wild elder shrubs or grow your own, what medical studies have shown about the benefits of elderberries and elderflowers, and over 70 recipes for elderberry and elderflower medicinal remedies, jams and jellies, desserts, alcoholic beverages and more. Elderflower tea is said to help cure stuffy noses and ward off colds that are starting to develop if taken often at the first sign of illness. This is a lovely tea to sip to fight off whatever bug is going around. It’s also great for seasonal allergies. As a bonus, it tastes delicious! Steep the dried elderflowers in one cup of boiling water. Stir. Infuse for five minutes. Strain and add a squeeze of lemon and some honey. Dosage: Take three to four times per day at the first sign of symptoms. Children can take half a cup, three to four times a day. Wash and sort the elderberries, tossing any stems or moldy berries. Fill a pint jar or other glass container with the elderberries, nearly to the top, and mash gently with a fork. Pour in the vodka to completely cover the berries. Screw on the lid. Shake the jar daily, topping it off with more vodka if needed. Let steep for 4-6 weeks. Strain through a colander into a clear jar, pressing the berries to release all of their juice. Transfer to small bottles with droppers and store away from light. It will keep for several years, though it will lose potency somewhat after time and will be most effective the first year. Dosage: Adults may take 10 drops up to three times a day as an immune booster and to prevent illness. In times of illness, adults may take up to 30 drops, three times a day (20 drops is a quarter teaspoon). Drops may be administered in a glass of water or under the tongue. * Note that this has alcohol, so use your discretion about administering to children. 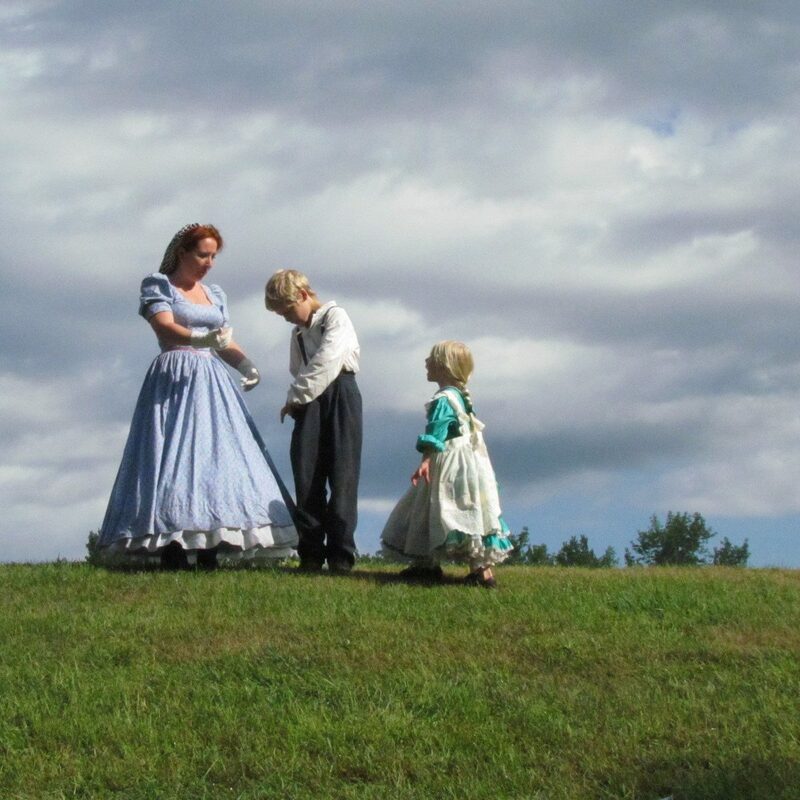 Standard traditional dosage of elderberry tincture for children over two years old in times of illness is 7-10 drops, up to three times a day, in a glass of water or tea. You may wish to avoid the alcohol and administer elderberry syrup or oxymel instead, or provide elderberries’ benefits with elderberry apple juice instead, gummies, popsicles or other alcohol-free remedies. We all know the benefits of elderberries for the immune system and to help kick colds and flus to the curb, but sometimes you’re too busy with sickness to make a new batch of elderberry syrup or you’re out of honey. Here’s a super simple way to get the benefits of elderberries in sick kids (or grown-ups! ), along with needed liquids. 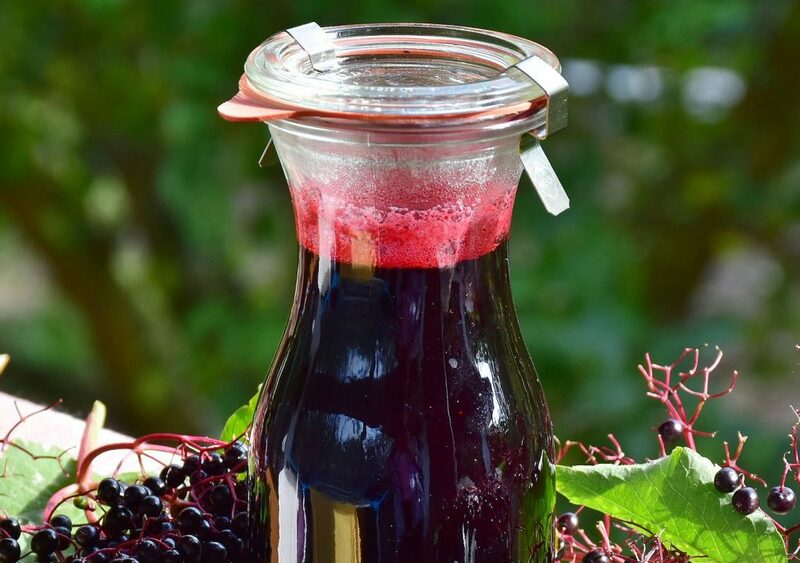 Each quart of juice has as much elderberry goodness as an entire batch of elderberry syrup. Have the family sip it throughout the week in times of illness or when you want to give everybody’s immune system a boost. Measure two cups of the apple juice into a saucepan and add the elderberries. Bring to a simmer and simmer gently for 30-45 minutes. Use a potato masher to gently mash the elderberries, then strain through a fine mesh strainer into a 2-cup measuring cup or clean jar. Carefully pour the liquid into a large jar or back into the apple juice container. Pour in the rest of the apple juice, shaking or stirring gently to mix. Dosage: Encourage kids (and adults) to drink this throughout the day. There is no maximum dose. Keeps for several days in the fridge. Remember that elderberry works best if taken often throughout the day, rather than in large single doses. The information in this post is for educational purposes only and is not intended to diagnose, treat, cure or prevent any disease. It is always recommended that you consult with a qualified healthcare practitioner before using herbal or pharmaceutical products, particularly if you are pregnant, breastfeeding, or on any medications. Can I use frozen elderberry for tincture ? “The Journal of Agricultural and Food Chemistry published one study that investigated the effects of freezing on the levels of anthocyanin (a component of elderberries and other fruits which studies have shown has anti-viral, anti-inflammatory, antibacterial and anti-cancer properties, among many other health benefits) on three varieties of American elderberries (Adams II, Bob Gordon, and Wyldewood). The authors also acknowledged that they thawed and re-froze the elderberry samples for each testing, and this process could have contributed to the breakdown as much as the freezing itself, too. Of course, all of these are commercial varieties of elderberries, and your wild elderberries are going to have unknown amounts of anthocyanins and unknown reactions to freezing. This is a good study to give you an idea of the potential effect, though. All elderberries will lose some of their medicinal properties during freezing, but they will lose less if you freeze them for a shorter time (such as three months or less). The longer elderberries remain frozen, the less they will retain their medicinal properties. FREE New Printable Nature Magazine for Kids! Free October Nature Find Printable!